The National Police Commission (NAPOLCOM) has released results of November 2014 PNP Entrance and Promotional Exam in just few weeks after the test. Complete list of passers and Top 20 for PNP, Superintendent, Police Inspector, Senior Police Officer and Police Officer are available on this page once officially released online. Though the total number of examinees of Philippine National Police (PNP) entrance and promotional examinations on Sunday, November 9, 2014 was not revealed by NAPOLCOM but it is expected that more than 30,000 took the test in designated exam centers nationwide: Makati, San Fernando (La Union), Tuguegarao, San Fernando (Pampanga), Cabanatuan, Calamba, Cavite, Calapan, Legazpi, Iloilo, Cebu, Tacloban, Pagadian, Cagayan de Oro, Davao, Koronadal, Cotabato, Butuan and Baguio, and in Odiongan, Romblon; Sablayan, Occidental Mindoro; Liloy, Zamboanga del Norte; and Bongao, Tawi-Tawi. 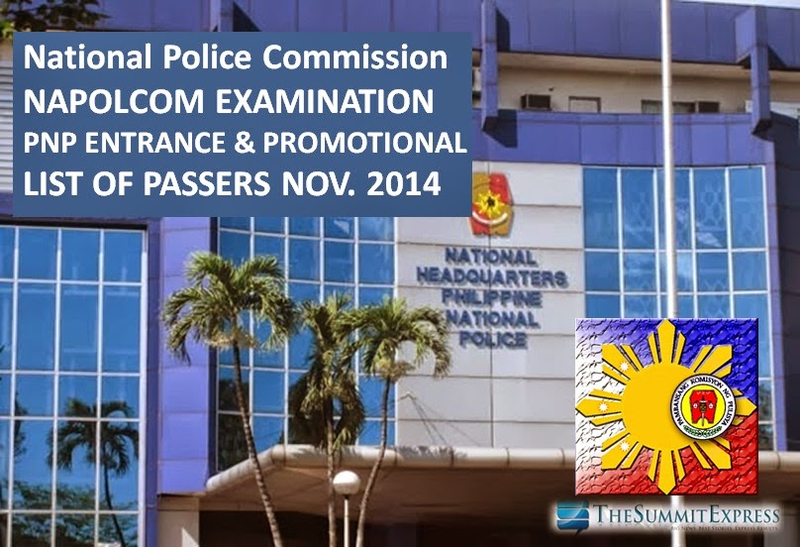 November 2014 NAPOLCOM exam covers the qualifying examinations for Police Officer I and the promotional examinations for Police Officers 2 and 3; Senior Police Officer (for SPO1 to SPO4); Police Inspector (for Inspector and Senior Inspector); and Police Superintendent (for Chief Inspector and Superintendent). November 22, 2014 Update: The complete results for PNP Entrance Exam are now out online. Results for Promotional examination as well as the Top 20 are expected to be released in the following days. In October 2013 exam, results were officially announced online in nearly three (3) months from the date of examination. A total of 33,734 examinees took the NAPOLCOM exam. In April 2014 exams have results posted in less than 2 months after the exam. NAPOLCOM Vice Chairman and Executive Officer Eduardo U. Escueta said that 14,256 took the PNP entrance examination while 21,101 were distributed to the various promotional test categories.